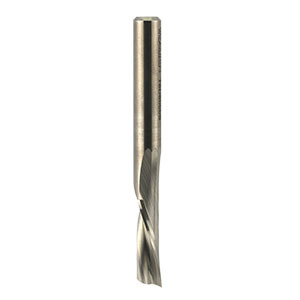 A range of high quality micro-grain solid carbide single flute spiral cutters primarily intended for use in CNC and fixed head routing machines. These specialist cutters offer high performance routing, with fine finish and high feed rates being prime advantages over straight flute cutters. 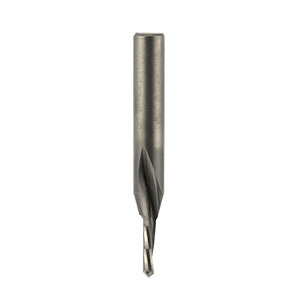 In cases where carbide tip tools perform well, spiral routers will cut smoother and generally last up to 5 times longer. This extra tool life means fewer tool changes, less setup time and longer production runs. The cutters are suitable for use at speeds of 17,000 to 25,000 rpm and with feed rates of 3 to 10 metres per minute. It should be noted that the most common reason for premature wear is insufficient feed rates and worn collets are the main cause of tool breakage. DOWNCUT or UPCUT SPIRAL - which to choose? 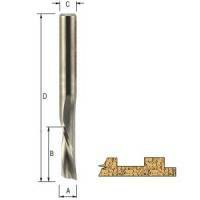 These tools are designed primarily for the cutting action to help hold material in place while routing. Recommended for use on all hand held routers and CNC equipment where hold down or vacuum systems are inadequate. This is generally the safest way to route. Downcut spiral should be used on small parts where movement could occur and will deliver an ultra smooth cut requiring no sanding. When in doubt choose downcut spiral cutters. 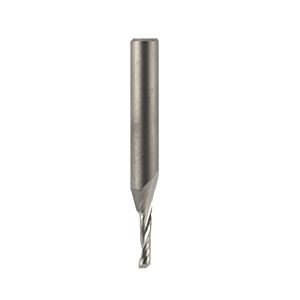 CAUTION: When using downcut spiral tools, care should be used, as chips may clog or pack in the slot being routed. These tools are designed to pull chips up and away from the part that is being cut and, in addition, will prevent burning when plunge cutting. Delivers a very satisfactory cut with fast chip exit and removal. 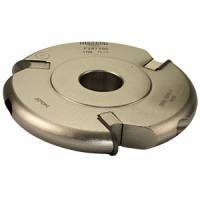 Upcut spirals should only be used on equipment with good vacuum hold down or clamping devices. Any failure of the clamping will allow the part to move and will result in tool breakage. Upcut spirals should be chosen if dust or chips present problems. Micro-Grain carbide is made up of higher concentrations of cobalt and binder materials not found in lesser grades of carbide. The increased amounts of binder that go into Micro-Grain make it possible to achieve a much sharper cutting edge when grinding. This sharper edge will perform very well under normal production runs and should give considerably longer life compared to standard grade tungsten carbide cutters.